Unboxing like it’s 1982. 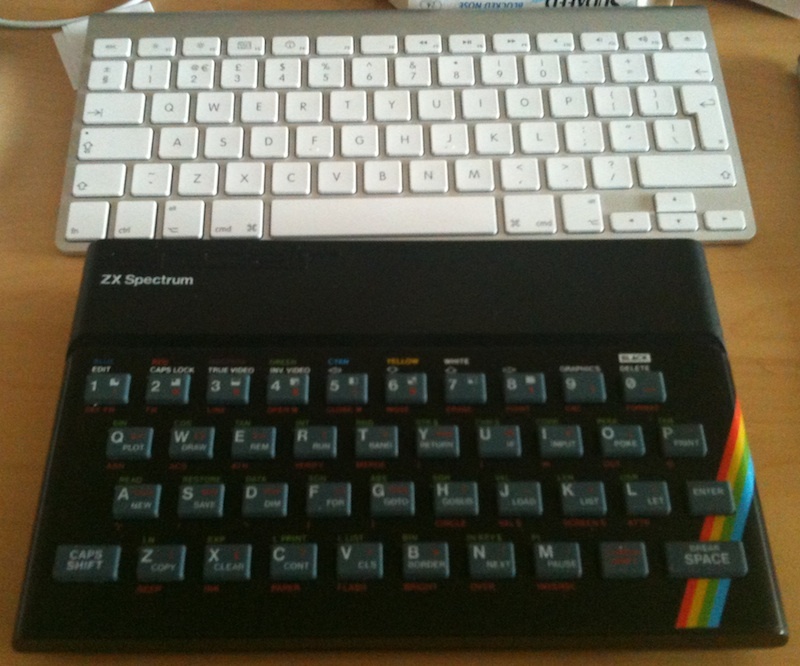 Screw Apple, it’s ZX Spectrum day! I must admit that I was a C64 boy. I loved the colour, the arcade games and the sound. The SID chip, in capable hands, was a thing of pure joy. By comparison, the ZX Spectrum seemed a little prehistoric, although it was admittedly a lot better for certain games, such as anything involving vector graphics and isometric design. Two other things the Speccy had going for it over the C64 were its Britishness (it was made during a time when, amazingly, the UK was one of the biggest manufacturers of home computers, before everything went horribly wrong and the Americans took over entirely) and it looked beautiful. Only stalwart, stubborn Commodore fans would argue the C64’s beige box was anything other than an ugly breadbin, but the dinky Speccy still has an almost Apple-like charm. I’ve been after one for the office for a while now, to happily display as a reminder of solid, beautiful British retro design. 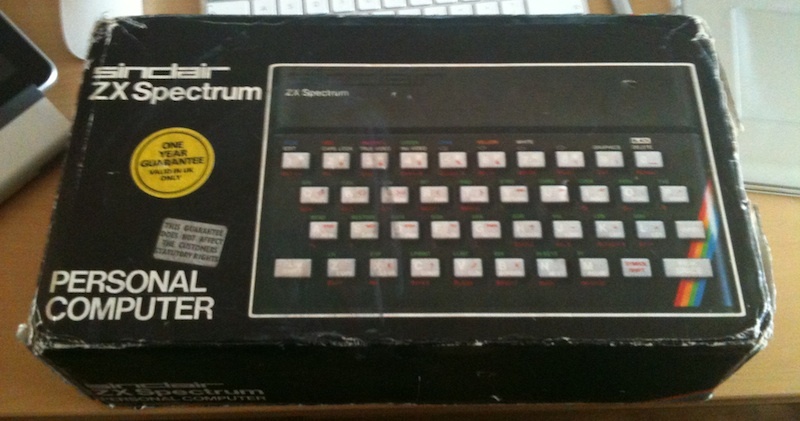 However, getting a Spectrum in good condition and for a reasonable price isn’t that simple. Luckily, I won an eBay auction at the weekend and my parcel arrived today. The anticipation of unboxing the thing, I’m sad to say, beat unwrapping my iPad. Yes, I’m old and sad, but what can you do? Here’s the box. It’s a wee bit tatty, but, to be fair, the seller said this was the case, and it’s 30 years old. Man, I’m old. In the box. All is looking good. That polystyrene’s seen better days, but the unit itself is looking very good indeed. HURRAH! Old vs. new. That the Speccy doesn’t look idiotic sitting next to a year-old Apple keyboard says a lot about Sinclair’s designers. I wouldn’t argue the same about a C64! Also: HURRAH! 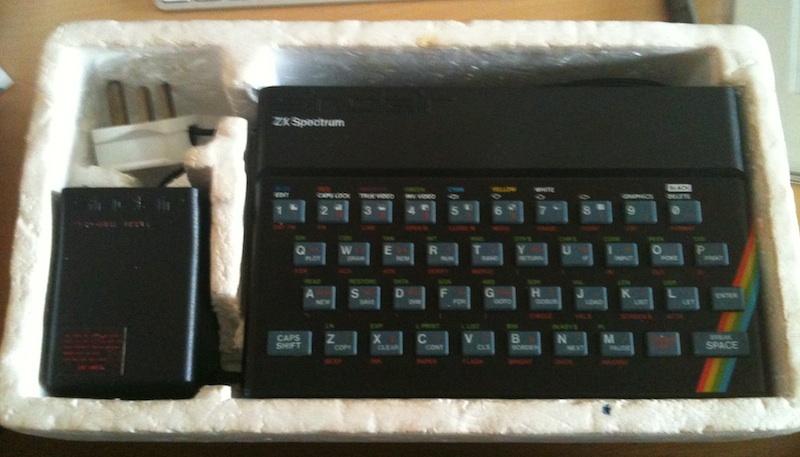 ZX SPECTRUM IS HERE! Jupter Ace was better. Forth > BASIC. I’ve wanted for a long time to make a keyboard driver that interfaces with a Speccy somehow plugged in to my Mac (for, you know, “fun”). It would let you use the Speccy as a keyboard. The “only” problem – and the thing that I think’s stopped me seriously attempting it – is that you’d need a program on the Speccy side too, which (besides me having to remember Spectrum BASIC, or learn Z80 assembly and how to use it on a Spectrum or something) you’d have to load from tape before you could actually use your keyboard. @Jamie: You know Elite’s planning on releasing a Speccy-shaped iOS controller for its emulator, right? Your idea is, amazingly, at least 50 per cent crazier.